Yup! Part of the reason I bought season tickets this year is so I have my spot saved for games like this. I have always gone to a game or two at the Al each year but tickets have been easy to come by in the past. I'm hoping schedules like this combined with a winning team will make this a hot ticket. Alrighty. Circle your calendars. Oct 2nd, 2021. Bison return to the Alerus Center for the first time in 18 years!!! Might be Homecoming as well. One of the most anticipated football games at the Alerus in years!! The MVFC has been on two year rotations for odd team scheduling since USD was added. I imagine ISU Sycamores and UNI will be added in 2022. Still a nice schedule in 2021 with USD and SDSU road games. Should be able to see the team play 6 conference games that year. I’m sure there are uglier jersey concepts on the planet,.....I’ve never seen one, but the law of averages say that there has to be something worse. but, maybe not. I mean, we did just get Shane Pinto! Yup, not sure how the rotation works. We miss out on Indiana State and UNI the first two years? Seems a bit of an odd rotation. 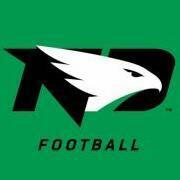 By my count, with matches, UND football has already received more than $25K today. $7,433 (x2) for football priority needs, $5,000 (x2) for the Little Big Man scholarship, and $520 (x2) for the Gene Murphy scholarship. 1. The Hawk is ALWAYS white. Every presentation. ANY presentation. The Hawk is always white. 2. I'd rather see the horizontal bands narrower than the logo, like the Habs, Wild, and Panthers here. If thats the case I will be making the trip up for UNI and NDSU that year! Edit: It appears that we do not play UNI in 20 or 21. That's odd. If you have the money and space, that whole thing would be nice for something like a home bar. I agree, but last week I renewed my Champions Club membership and bought season tickets so I am tapped out for right now. I'm in for the next football priority fund! Maybe, East Coast kids rarely come this way, but maybe. Seems to be a rumor around Northeastern. Does high bidder get to choose which letter they want? I can't do the whole Ottawa thing, but putting the logo on a horizontal stripe might make it work on the chest. When folks put it in the circle motif they end up putting horizontal striping behind the logo. It helps widen it out so it's not so squarish on the chest. Also, the words "North Dakota" are not required any more. When using the interlock the words "North Dakota" had to be nearby as Notre Dame has that trademark (even though UND used it first). No interlock means no required North Dakota wordmark. I've heard a couple screens are going into the 2 bars in the arena. That needed repeating. Heck, I'll save folks the click: Ralph was businessman people. He changed with the broader market and the broader market is moving away from monikers like UND's prior. He knew those days were coming.